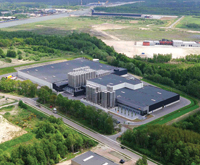 Sabic Innovative Plastics business plans to significantly boost capacity for its Stamax long glass fibre-filled polypropylene (LGFPP) composite resins at its manufacturing facility in Genk, Belgium, to meet rapidly growing demand from automotive customers. The company began work on a new production line – slated to open in the second half of 2013 – to further its ability to provide a secure and reliable local supply of this high-performance Sabic material. Stamax LGFPP composite resins give customers a robust combination of properties, while enabling exceptional light weight to provide the potential to improve fuel efficiency and cut emissions. This lighter weight allows for a significantly enhanced carbon and energy footprint over the life of a car or truck compared with traditional materials. The Genk capacity expansion demonstrates Sabic’s commitment to automotive customers worldwide and their need for high-performance sustainable solutions that will enable them to design and produce next-generation vehicles. "When we constructed the Genk facility, we proactively built in scalability in anticipation of customers’ future needs," says Leon Jacobs, Innovative Plastics’ Automotive leader in Europe. "It took only two years before we needed to scale up with this new, state-of-the-art production line because our Stamax composite resins have become a material of choice for a growing number of automotive applications. Stamax composite resins give customers outstanding value, especially by assisting in meeting toughening automotive design requirements, reducing overall system costs and increasing sustainability. By providing our customers with an expanded supply of this versatile, high-quality material – in combination with our world-class application development services – we are further able to help them differentiate their products and grow." Stamax composite resins are also available to customers from Sabic’s Bay St Louis, Mississippi site in the Americas, which opened in 2011. Bay St. Louis was modelled on the design and technology of the Genk plant, the largest greenfield PP compounding plant ever built in Europe. Genk also houses a Compounding Innovation Center. Sabic’s Stamax LGFPP composite resins offer several advantages over other materials in automotive applications. Compared to steel, Sabic composite resins are light in weight, do not corrode and facilitate parts integration.